I like to develop a monogamous relationship with my gum. Very rarely do I let my eyes wander to a younger, flashier gum. I find that if a gum supports me through my most intimate moments in life, it should be rewarded by being placed in my front pocket 24/7. Oh sure...when I was a kid, I was a gum whore. I'd slip anything into my mouth. Juicy Fruit, Doublemint, Fruit Stripe...I made the rounds. I settled down with Wrigley's Extra through my school years. (Dark blue pack--Winterfresh ) I usually ate a half a piece at a time, and would give the other half to my friend who sat in front of me in English. His breath bore a unique resemblance to La Choy soy sauce. He thought I was just friendly with the gum. I actually shared because I wanted to stop my eyes from watering every time he said "Whaaaat's the aaaanswer" in slow motion while breath fumes accelerated acne reproduction. Our relationship was solid, but I hit a mid-life gum crisis a few years ago and gave Stride Winterblue a try. From the instant Stride met my lips, I knew we were meant to be together. I dropped Extra, and for the most part haven't looked back. From time to time I'll hook back up with Extra. Sometimes it's really hard to ditch your ex. Stride had everything I wanted in a gum. Taste, texture, long-lasting flavor, and I can chew it for a couple hours without my jaw feeling like I spent 2 hours at the dentist. Plus I don't have to "pop" my gum out of a medicine-like tray. Unfortunately, my gum-libido got the best of me. On a recent trip to the grocery store, I was perusing the aisles for my dinner needs. Walking by the candy aisle, I saw Wrigley's 5 gum. I'd seen 5 gum before in the grocery store trying to pick up on anyone that walked by. Flashy packaging...who knows what 5 is carrying?? But as I got closer, I noticed that this was not the normal 5 gum. This was a new flavor called React. 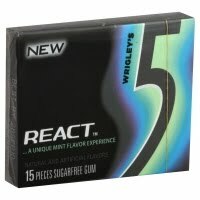 In fact, there were 2 different flavors called React. One was a tropical fruit, and the other was a mint. I'd never seen these 2 new flavors, and the mint version managed to sweet talk its way into my shopping cart. Here is the nitty gritty on the new React flavor from Wrigley's 5 gum . Taste--It is quite pleasant. Not too over-powering at first, and has the trademark Wrigley's long-lasting flavor. Jaw Soreness--After 90 minutes of chewing, I spit the gum out...not because my jaw hurt, but because I just didn't want gum anymore. I spit instead of swallowing my gum. Packaging--This is a nice feature of the gum. People might think you have a new mp3 player or something in its flashy packaging. Let's just hope you don't get confused and plug your headphones into the package. Texture--This is where I ran into problems. Extra gum was just a little too "squishy" for me. Sometimes I'd find a stray clump of gum between teeth when I flossed that night, or it broke apart too easy in my mouth. Stride excels in this area. Stride is a gum that sticks together. I'm sorry Stride....It was a momentary lapse in judgement. I can't promise to be with you forever, but I can tell you that 5 React gum was just a one-time deal. Let's rent "The Proposal" at the Redbox and forget this ever happened OK? Wrigley's 5 React (mint) gum is a worthy gum. I'm positive that it will find the right person to spend its life with---but that person isn't me. 3 chewy stars. Loved the Wrigley's gum review! Thanks for the heads up the taste, texture, flavor, etc. I love gum just like that! I unfortuantly can't have it as much these days because of TMJ! Have a Blessed Day, Matt!